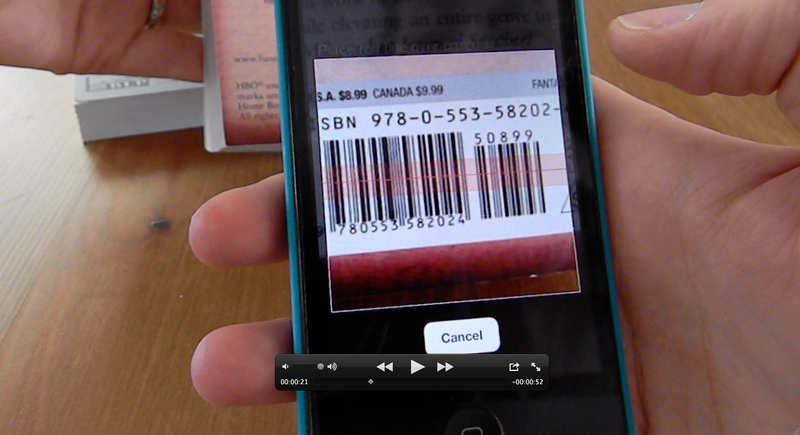 We’ve just added a great new feature to Library Anywhere—barcode scanning. Our new barcode scanning feature is available in both the iPhone (and iPod Touch, iPad, other iOS products) and Android apps for Library Anywhere. It lets you quickly scan the ISBN on a book and see if your Library Anywhere library has a copy. The Library Anywhere book scanner is unique in that it searches not just for the exact ISBN you give it, but for any other editions of that title that might be in the library. So you can scan a paperback book with the “now an HBO show!” cover, and Library Anywhere will find the hardcover edition of the same title, if that’s what the library has. It also doesn’t limit you to just one library—if no editions of the book are found in the first library you search, it will then give you a prompt to do the exact same search in other Library Anywhere libraries near you, or find the book at an online bookstore. The barcode scanner also can scan QR codes, so libraries using our QR code feature (more about QR codes and Library Anywhere) can scan a code in their OPAC to bring up the record in Library Anywhere. This isn’t an “optimum package” feature. Libraries don’t pay more to turn it on. We don’t play like that. Library Anywhere is the mobile catalog and homepage for almost 200 libraries and library systems worldwide. See all the libraries using Library Anywhere by simply clicking the … menu within Library Anywhere and choose “Select a Library.” Read more about Library Anywhere here. Very nice! Thanks for adding this. Barcodes that deface a cover should not be allowed. Authors pay good money for an artist to create their cover and no person should be allowed to deface it with a barcode. They belong on the back cover! This is a great feature – does LibAnywhere link to a “request the library purchase this item” if someone scans something that isn’t in the catalog? This sounds great! Since you now have this capability working, will we be seeing an iOS app that allows us to scan and add our books to our librarything accounts?? Hope so! Thanks! It would be really cool to see if the book is in my LibraryThing library too. I can never remember whether I’ve got a particular book or not! To the person who believes barcodes should not deface a book cover – barcodes are placed on book covers to facilitate scanning for loan, return and stocktake. the placement is crucial for ease of use. Think about the people who do this for a living in future. Librarians top concern is always “What makes my job easier?” Bookstore employees also use barcodes to process books (and many more times a day I might add!) and yet the barcodes are always on the backs of the books, where the customers prefer them. I have worked in both bookstores and libraries for many years, and each has their advantages and disadvantages of course. Where the good bookstore always trumps the library, is anticipating, meeting and exceeding the customer’s needs. Libraries have a hard time getting past the idea of how much they are needed, so whatever works best for them is, of course, the best way to do it.